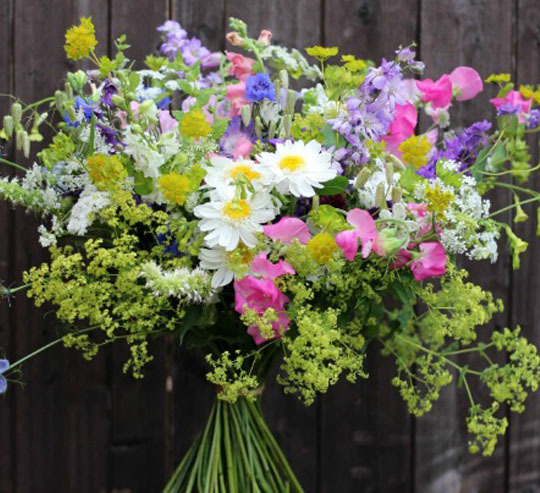 When planning what to grow in the year ahead there are lots of things as a flower farmer you have take into consideration, who will be buying your flowers, are they for a bride or will they be given as a gift to a special friend. We look at our specific growing conditions and will that plant thrive in our soil? As well as trends and fashions from around the world. But most importantly for me, it’s more about whether I like the flower in question. In the time I’ve been flower farming the more I like something the better I’m able to grow it. 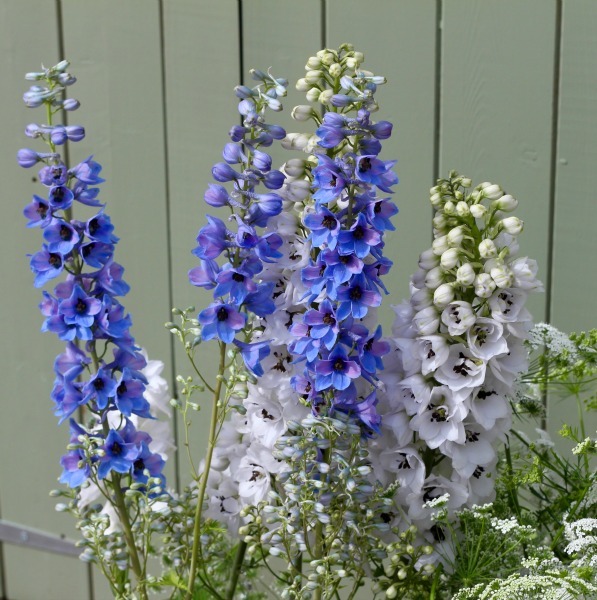 There’s lots of help and inspiration out there when choosing what to plant, but one of the things I look forward to hearing about most is what will be the new “Pantone colour of the Year”. Pantone is the world-renowned authority on colour, using their unique standardised colour matching system. By standardising the colours, different manufacturers and industries can all reference a Pantone numbered colour, making sure colours match without direct contact with one another. Annually, Pantone declares a particular "Colour of the Year". To select the colour of the year, Pantone looks at what hues are making waves in the entertainment, film industry, art collections and product design, as well as popular travel destinations. The colour chosen is becoming more influential each year. Colour forecasters, manufacturers and fashion buyers all put stock in its selection. So back in December, the 2016 colour of the year was announced. 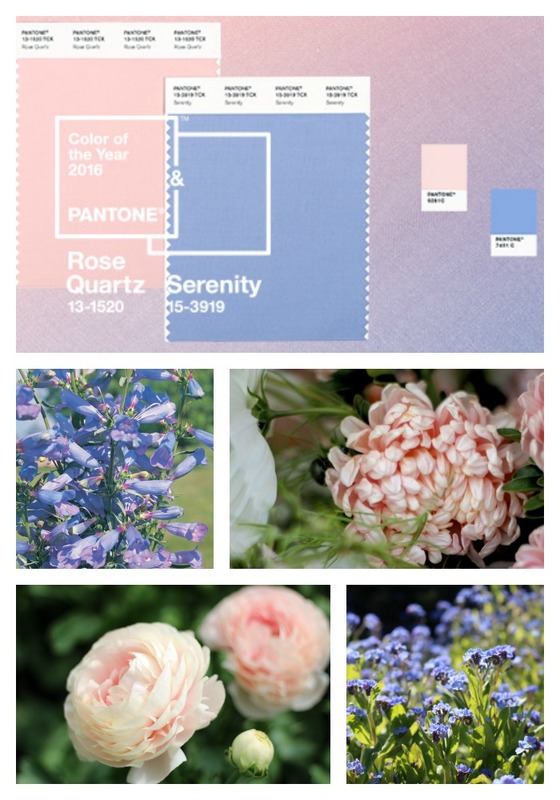 This year was a little different because for the first time Pantone introduce two shades, Rose Quartz and Serenity. Both quite lovely and just the kind of colour I like. Rose Quartz is a persuasive yet gentle tone that conveys compassion and a sense of composure while Serenity is weightless and airy, like the expanse of the blue sky above us, bringing feelings of respite and relaxation even in turbulent times. 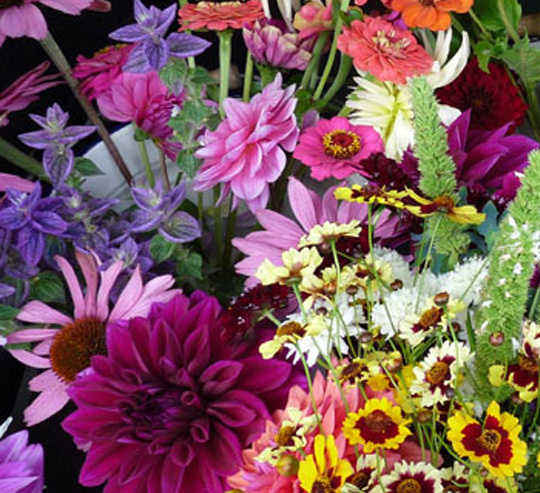 Its great fun choosing flower varieties that match these colours and it also enables us to be current and up to date. 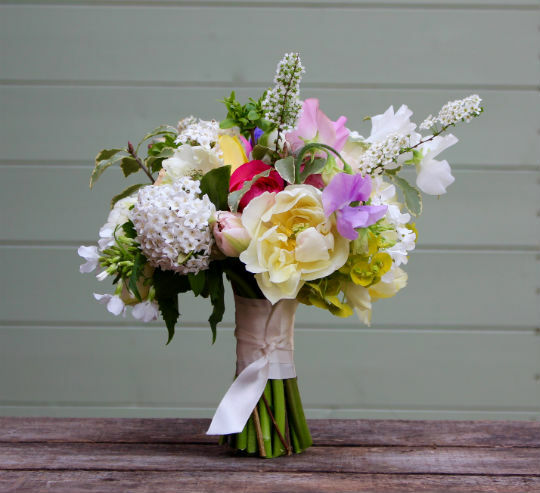 These two colours work so well together offering so many great flower options to choose from. Here are just a few I’ve picked to grow this year, some have earnt their place and are returning from last year while others will be new additions. During the hustle and bustle of pre-Christmas December, I love to spend a day with my daughters making our wreaths and table decorations. Over the years this has become an antidote to the stresses of Christmas Day preparations and one that I always look forward to. 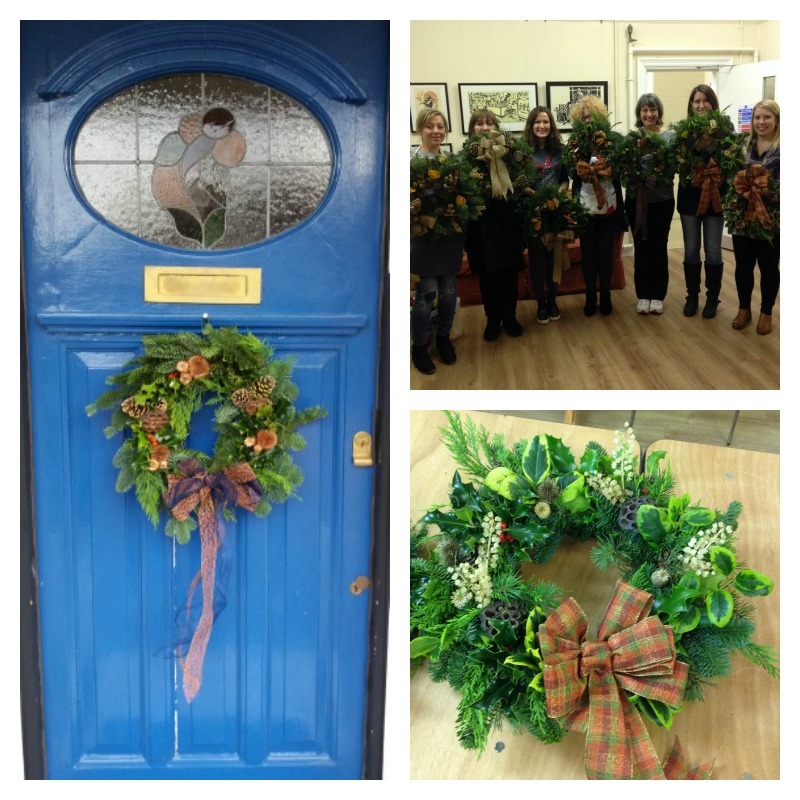 Jo decided to hold her Christmas wreath-making workshop at Baldock Arts & Heritage Centre, the perfect location for a warm and relaxed afternoon. We were very lucky to be joined by Bella, Jo’s young daughter and enthusiastic assistant who very quickly helped to provide us all with a welcoming tea/coffee. There was some extraordinarily delicious and potent mulled wine being passed along the table also and in no time at all we were relaxed and ready to go! 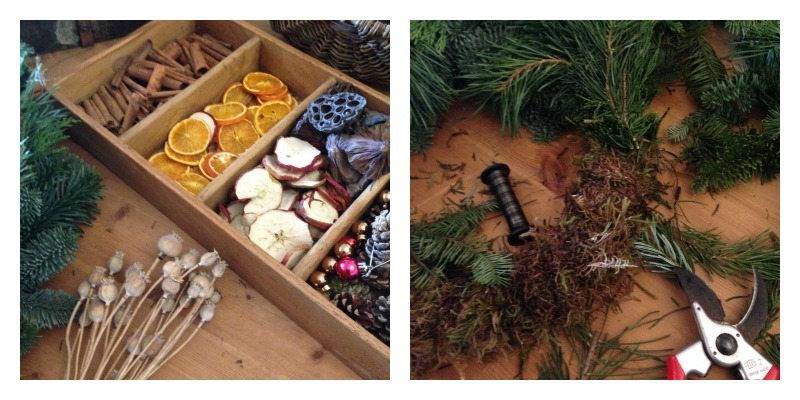 Jo started by demonstrating how to make a traditional moss base covered with a selection of fresh foliage and we set to creating our own unique versions, at the same time filling the air with a nostalgic Christmassy fragrance. Once these were prepared it was time to choose our colours, textures and patterns and Jo had an outstanding array of adornments. There were all manner of dried flowers and seed pods from the farm, cones of varying sizes, dried fruits and spices, ribbons galore, baubles and sparkle. 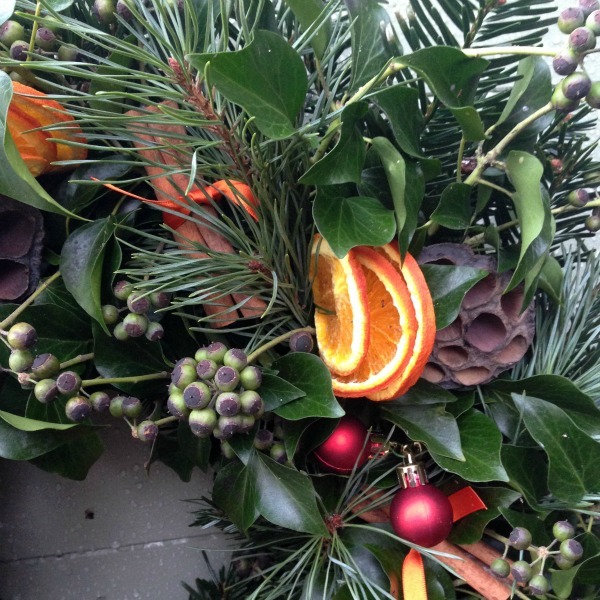 With Jo’s help we were able to make our choices, hand tie our bows and decorate the wreaths in a style of our choosing. I am surprised that given the same materials, a group of people can create very individual works of art and this workshop was no exception. We were all pleased as punch with our wreaths as you can see from the photo and I for one could not wait until December 1st before proudly displaying it on my front door! 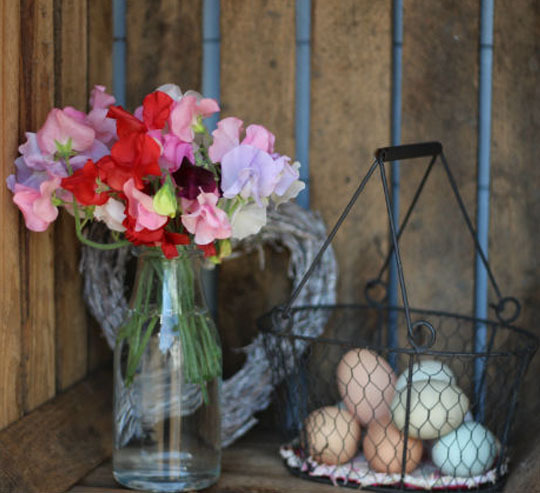 There are routines within flower farming that should always be adhered to and one which Jo and I have no trouble sticking to, is the coffee routine! We wander around with our steaming mugs accompanied by Bertie and Frank (the resident dogs) down to the field, discussing as we go our plan of action. On passing the greenhouse I am amazed how quickly the plug trays full of ranunculus have grown. Preparing the poly tunnel to plant these healthy little plugs out has to be our priority for today. Weeding was our first step, gently forking over the earth and removing the roots. As any gardener knows, often a little green shoot on top reveals an enormous amount of stubborn growth underneath, making it very labour intensive. 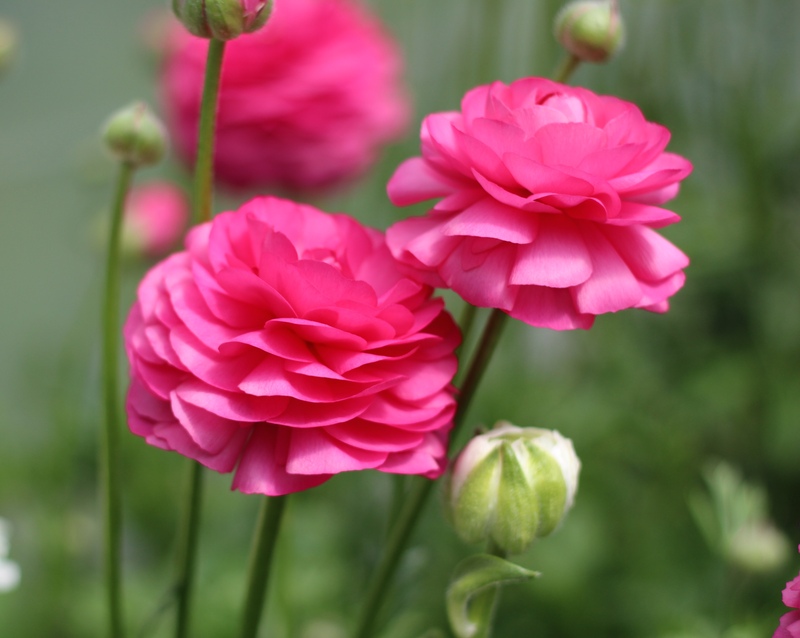 A task that is vital is to ensure the little ranunculus has unencumbered space to grow. 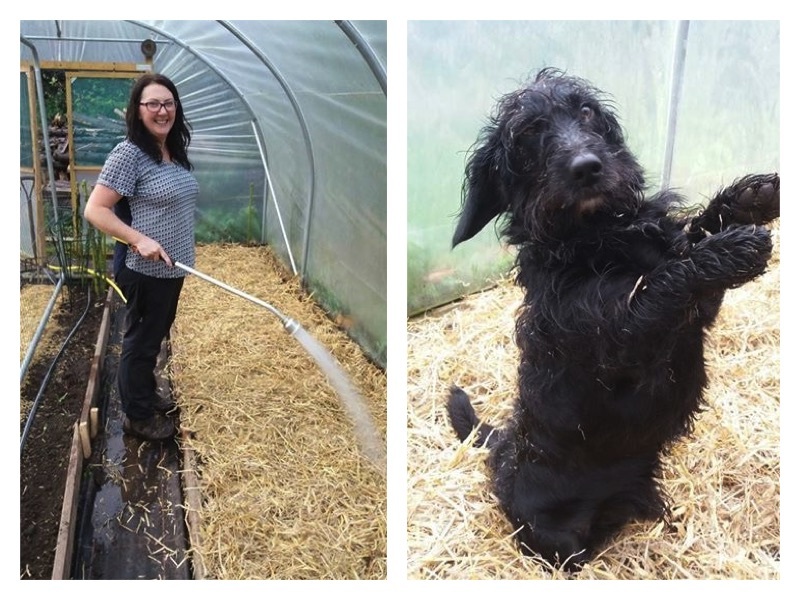 Next step is to feed the earth with a healthy dose of compost and fish blood & bone, sounds absolutely delightful, especially when Jo reveals something has been living in the compost heap! We decided to call on our canine companions as defence whilst we tackled this nutrient rich pile and it did the trick, nothing jumped out or scurried off! With the earth prepared, it was time to check the irrigation, a big bonus to any large scale growing. The t-tape was relayed and tested, unfortunatly one or two had been punctured and needed replacing from the large reel outside. It never ceases to amaze me the excitement one feels from a job well done and the successful testing of our handywork was one of these occasions. Our final job of the day was to lay a covering of straw over the top of the beds to help keep moisture in. Frank thought this was laid especially for him and he was in his element as you can see from the photo below. Well, where do I start, the beginning seems like a lifetime ago and that is an absolute sign that I’ve loved every minute. I’ve always had a real passion for gardening so when we moved to our house 4 years ago in Baldock, with its very large garden, I was in heaven. At that time the garden was not ideal, so first on the list of things to do was to get it landscaped. That was going to be our priority and the inside of the house would come in time, especially as our littlest one was (is) still writing on the walls! After lots of hard work and designing, the garden was landscaped. The pride was overwhelming but then came the exciting bit for me; it was time to start filling it with plants. I was always in a garden center or had my head in some book or other researching my latest idea, it became a big part of my life. The garden started to take shape, although like most gardens I feel it will always be work in progress, my life project I guess, and I wouldn’t have it any other way. As time went on I began to wonder more and more if I could turn my love of gardening into a living somehow. Then one night the penny dropped. I sat down to watch The Great British Garden Revival at home and that was the point at which I thought I can do this. It had such a huge and positive impact on me and I knew that this could be the start of something special for our family. The seed was sown as they say! They say every plan starts with a big idea, and I had mine. I was going to grow and sell flowers and maybe one day I could call myself a Flower Farmer. 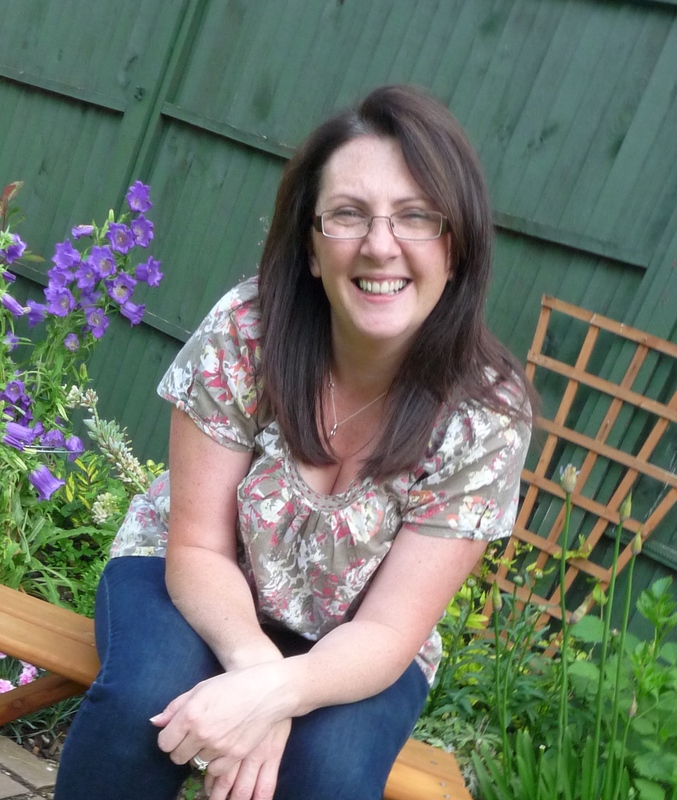 I set about researching and planning but the biggest challenge of all was persuading my husband that this idea of mine could one day be a viable business. I think I started to win the battle and talk him round as we started work on preparing the area in our garden. I had already started growing some hardy annuals the previous autumn and also had a few other plants growing in the cold frame. There was so much to do to prepare the land not least the small problem of 65 30f laylandi conifers growing in the middle of what would become a flower field. So Easter weekend of 2014 we set about removing the conifers and their roots. Over the next few weeks we installed the rabbit fencing and a poly-tunnel and the next big job was to get the plants in the ground. What was wonderful about this experience was that it was real family time. My two girls were ‘all hands on deck’ and Phil, my husband, was an absolute star. It was moving forward and every seed that was sown was to be the start of something very exciting and now it was no longer a dream, but a tangible, real life, reality. It was the beginning of May 2014 and the plants were growing well, so I booked my first farmers market. It was nerve wracking but I knew it was time, that kind of ‘it’s now or never moment’. It was a great day and it was at that moment that I knew this was going to be what I spent my time doing. A lot has happened since then but what’s lovely is we’re still relatively new in the process and I learn something every week. It’s nice to finally be doing something as a career that feels like a hobby. So that’s how it all began, the Baldock Flower Farm is no longer a hobby but is the result of much hard work, commitment and a healthy dose of passion. I’ve realised that dreams can come true, that you get out what you put in and most importantly, I’ve learnt to be much more tolerant to the little one writing on the walls at home.